In the late 1980s, stay-in-place expanded polystyrene wall forms (EPS) hit the market, providing insulation values of approximately R-20 before finish materials are applied, and they are slowly gaining acceptance and market share. But the foundation systems most often compared and debated for new home construction are hollow core masonry block basements and poured concrete foundation walls. There are a number of similarities between these competing foundation systems, and many of the features and benefits used to market the two systems are nearly identical. Both foundation systems tout low maintenance. Both foundation systems are fire resistant. Both foundation systems are constructed by quality craftsmen. Both foundation systems are produced locally, using local materials and labor. Both foundation systems can be customized to produce fluted, brick, or other decorative effects. 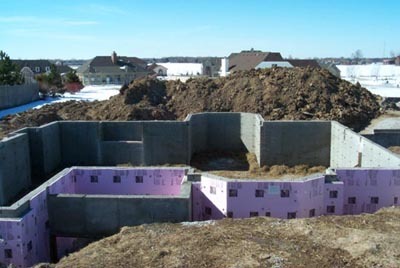 Both foundation systems can be customized to provided additional insulation values. Both foundation systems are affordable. Foundation walls serve three functions for builders and consumers. Foundation walls support the above-ground structure, retain the soil surrounding the basement area, and frame economical additional storage and living space for consumers. Poured concrete foundation walls are stronger than hollow core masonry foundation walls. Engineering tests and technical data demonstrate poured concrete foundation walls have both ultimate flexural strengths many times greater than hollow core masonry foundation walls to resist the pressures of earth, wind, and water, and ultimate compressive strengths many times greater than hollow core masonry foundation walls to support vertical building loads. How much greater? National building codes require hollow core masonry foundation walls to be reinforced with vertical steel when holding back unbalanced fill, if the fill exceeds 3'9" above the basement floor. Non-reinforced, poured concrete foundation walls exceed national building code standards for full-height fill by a large safety factor. Builders and consumers get 40% more concrete, dollar for dollar, in a poured concrete foundation wall. More concrete means a stronger, denser foundation with fewer pores or seams for water to seep through, and less call backs for the builder. Poured concrete foundation walls take less time to construct than hollow core masonry foundation walls. Time is money, and the quicker a builder can begin "roughing in," the more money he/ she saves. Poured concrete foundation walls provide the structural integrity necessary to bridge "soft" zones on "marginal lands," saving the builder and consumer time and money when construction takes place on fill or poor soil conditions. And technological advances in concrete admixtures provide quality control for poured concrete foundation walls constructed in inclement weather or freezing temperatures. Year-round construction allows builders to expedite backlogs and get a jump on new business opportunities. "Poured concrete foundation walls dominate the national market, with 72% of new homes with full basements choosing poured concrete foundation wall systems ... Concrete block holds 25% of this national market." Poured concrete foundation walls are best for builders because they are stronger, go in quicker, can be built on marginal lands, and can be constructed year-round. Nationally, seven out of ten builders choose to build new homes with full basements on poured concrete foundation walls.